KINGSTON — Since 2012, Grace Episcopal Church has held a prayer service honoring those who died during the Sept. 11, attacks on the World Trade Center. Each year, members of the congregation gather to remember people lost on that day and pray for those who live on without them. They do this around an appropriately unique symbol of hope and faith. This year’s service will be held at 8:30 a.m. on Friday, Sept. 11, in the Rusty Flack Memorial Garden, which contains a cross fashioned from a steel girder procured from the south tower of the original trade center. According to Father John Hartman, rector of Grace Episcopal, the offering of morning prayer is open to everyone, people who wish to celebrate the memories of lost friends, loved ones or fellow Americans, people who want to pray for those personally affected, or people who simply want to join in prayer for hope in times of struggle. 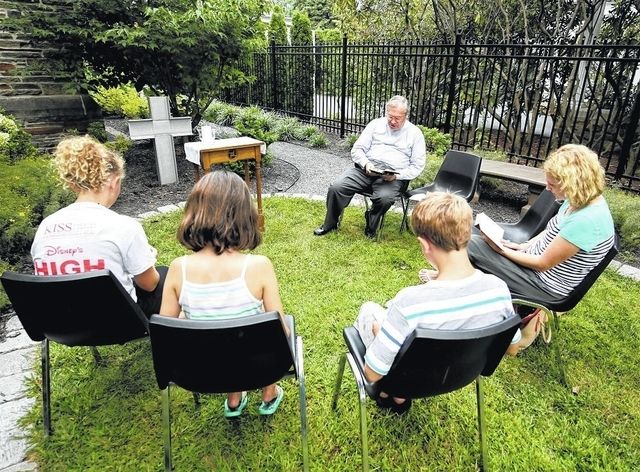 When Father Hartman came to the church in 2009, he was met with a situation where a family, which had lost a child, could not afford a burial plot for their loved one. The congregation pulled together and raised money for the family, but the experience left Hartman with a lasting impression. “I thought, ‘We should be able to provide our parishioners with a space they don’t have to pay for if they can’t afford a plot,” said Hartman. For insight on the matter, Hartman reached out to parishioner and respected businessman, the late Rusty Flack. Flack was a motivator in planning the development of a muddy, overgrown area of the church property into a memorial garden, but was diagnosed with cancer and began treatment before development was underway. Meanwhile, Jim Saba learned about his friend’s battle with cancer and set out to do something special for him. An environmental consultant, Saba had been contracted by a scrap company to aid in cleanup after 9/11. Wreckage from Ground Zero was taken to the Fresh Kills Landfill on Staten Island, New York, and much of the metal was eventually melted down to use in the construction of the Freedom Tower, which now dominates the skyline of lower Manhattan where the Twin Towers once stood. Some of that metal was still at Fresh Kills by the time Saba heard of Flack’s diagnosis. Following the Sept. 11 disaster, Saba and Flack realized they both had an eerie connection to the trade center. Saba had stood atop the south tower on Sept. 4, 2001, and Flack had visited the same spot only a month earlier. Saba reached out to one of the scrappers he had worked with and was able to get his hands on an eight inch interior I-beam from the south tower. He took that beam and had it made into a cross for his devoutly Christian friend. Saba delivered the cross to Flack’s home in Huntsville, where it stood as a source of inspiration, according to Flack’s wife, Kathi. After Flack passed away, Kathi Flack and Hartman discussed moving the cross to the memorial garden when it was finished. Before the cross was moved, Kathi Flack reached out to Saba to see if the man who gifted it would condone having it moved. Saba, who grew up on Butler Street in Kingston and had fond childhood memories of attending Boy Scout meetings at Grace Episcopal Church, was thrilled when the move was suggested. The cross was moved; the garden was finished and named after Flack. Today, the Rusty Flack Memorial Garden is the site of several prayer services throughout the year, including this 9/11 service, which allows for both exercising faith and reflecting upon a harrowing day in recent American history. Parishioners may also bury cremains there. “I consider myself a patriot, but my husband, Rusty, was really a patriot,” said Kathi Flack. She referenced the strong bond among Americans after 9/11, how it has dissipated in the years following the tragedy, and how she believes it is important to never forget. Saba said the symbol is significant for anyone who goes through life’s trials and tribulations and can speak to all people, whatever their individual struggles. 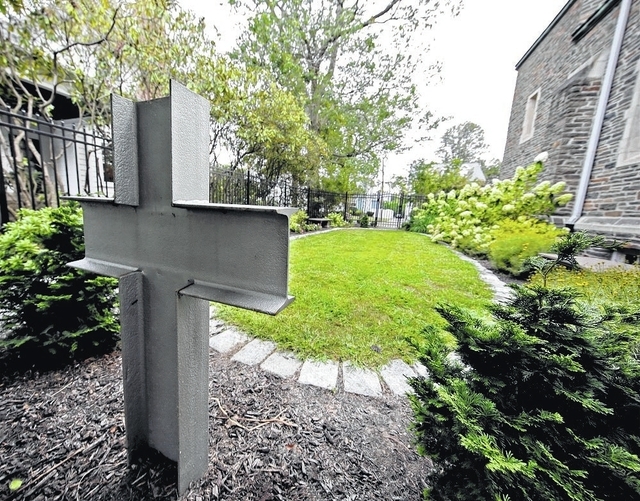 “That cross can be the source of a lot of strength for a lot of people, and having it in the memorial garden where now many people can view it, experience it and be part of that memorial garden, is a wonderful thing,” Saba said. This entry was posted in Uncategorized and tagged 9/11, Diocese of Bethlehem, Garden, Grace Episcopal, Memorial, prayer. Bookmark the permalink.